Arlo Guthrie tells a story about performing in a bar in Chicago in 1971. After the show a stranger came up and said he wanted to play him a song he wrote. Well, Arlo had experienced that before and as a result had heard a lot of bad songs. So he told the stranger, you can buy me a beer, and for as long as it takes me to drink it, you can do whatever you want. Today he notes, dryly: "It turned out to be one of the finer beers of my life." The stranger was Steve Goodman and his song was "City of New Orleans." Arlo's recording of it reached the Billboard Top 20 and made them both a nice chunk of change. I was reminded of that while pondering a dose of beverage that had a profound effect on my life, albeit not such a lucrative one. It was tea, not beer, and I drank it in a little cafe in Montclair, NJ, about 30 years ago. I was with my wife and a friend and while they were chatting I found myself looking out the window at the street and, being a writer of the sort I am, wondering: what if I saw a crime taking place? And what if there was a reason I couldn't just leap up and do something about it? Cut ahead two decades and "Shanks At Lunch" appeared in Alfred Hitchcock's Mystery Magazine (February 2003). 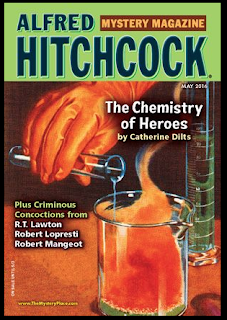 I mention all this because the hero of that story, conceived in that Montclair coffee shop, is making his ninth appearance in AHMM this month (well, the issue date is May 2016, but it is available now). "Shanks Goes Rogue" was inspired by three different things. First of all, I wanted to bring back Dixie, a character who had appeared in the story "Shanks Gets Killed." She is an eccentric woman who runs the charity favored by Shanks' beloved wife, Cora, which gives her plenty of opportunities to annoy my hero, and that's a good thing for my stories. The second inspiration was this: I had thought of a clue. Clues are hard for me and I wanted to use this one. I figured out how Shanks could take advantage of it. And finally, I had a hole in the book of stories I was putting together. To be precise: the last story ended on a gloomy note and that would never do for a book of mostly funny stories. As the saying goes, the first page sells this book and the last page sells the next one. So "Shanks Goes Rogue" was created to round out my collection of tales. 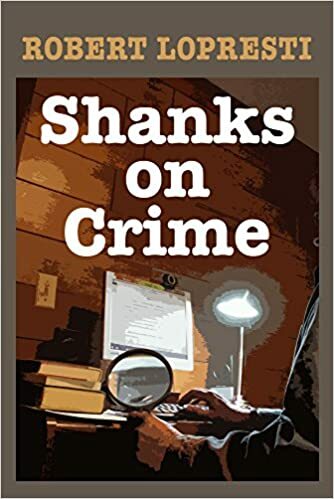 But then I had an unpleasant encounter with a telephone scammer, which led me to write a quicky story called "Shanks Holds The Line." I decided as a public service to offer it to Linda Landrigan for Trace Evidence, the Alfred Hitchcock's Mystery Magazine website. She put it up the next day. But there was no reason I couldn't use it to round out Shanks On Crime, so I did. Which left "Shanks Goes Rogue" looking for a home. Linda adopted it and here we are, happily ensconced in the annual humor issue. I hope it gives you a chuckle. Personally, I will celebrate with a nice cup of tea. Well done, Rob. Another AHMM score. Rob, a fellow has set up a bank of time-waster phone lines that people receiving scam calls can conference in (now a subscription service) called Jolly Roger Telephone. He publishes some of the funnier results on YouTube. By funnier, I mean pathetic. Inspiration is where you find it! Congratulations on the AHMM appearance and good luck with the anthology! Rob, and a fine story it is. Keep them coming.